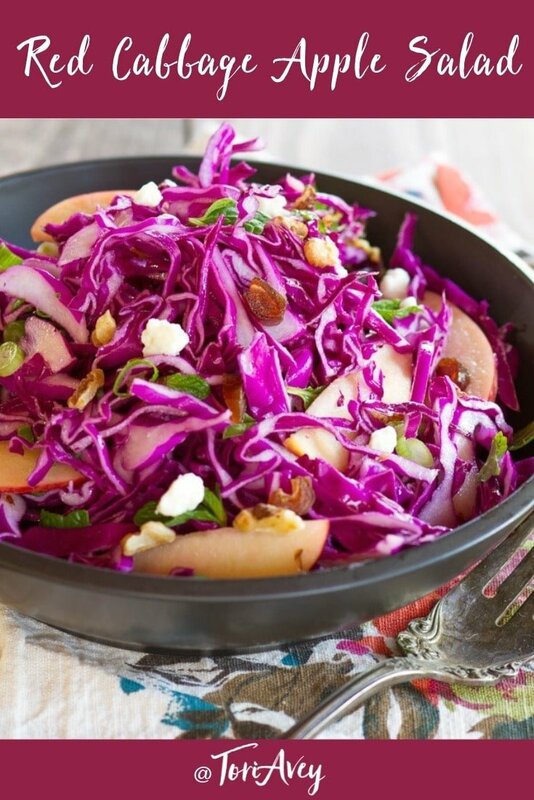 This unique and delicious Red Cabbage Apple Salad is loaded with flavor. Shredded red cabbage and thinly sliced apples provide a fresh, crunchy backdrop to toasted walnuts, dates, fresh mint, blue cheese and a tantalizing creamy dressing. The combination is refreshing, sweet, salty and satisfying. This salad, with its seemingly odd combination of ingredients, came from an Israeli cooking show. I’m not sure which one. My husband grew up near Tel Aviv and he occasionally enjoys watching Israeli TV via satellite. A year or two ago he came into the kitchen with a recipe he’d written down on scratch paper. He’d seen it on Israeli TV and thought it looked tasty. On first glance, it seemed like a strange combination of ingredients… cabbage, dates, apples, green onions, blue cheese, mint… but the more I imagined it, the tastier it seemed. He’d written down the basic ingredients (translating from Hebrew of course), so I played around with it until it seemed just right. It’s a very unique salad and we both flipped over it. I wish I could give credit where credit is due, but I really don’t know the cooking show this came from. If any of my Israeli readers recognize this very unique combination of ingredients, please comment and help me solve the mystery! 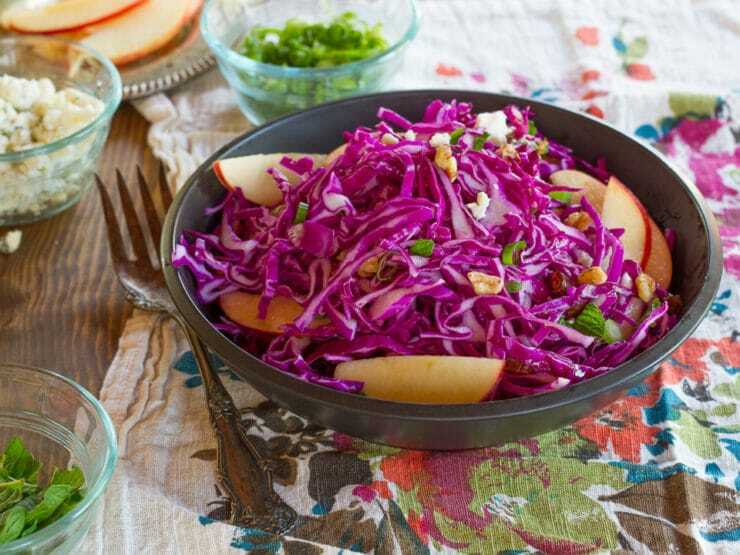 I love the crunch of red cabbage in this salad. The types of cabbage we’re familiar with today came from wild cabbage brought to Asia by roving groups of Celtic people around 600 B.C.E. Its ability to grow well in cooler climates made it a popular crop throughout the northern parts of Europe. 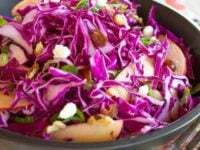 Cabbage is low in calories and loaded with nutrients, including potassium, vitamin C, folic acid, calcium, vitamin B6 and magnesium. If you’ve never shredded cabbage or need a little refresher, check out my tutorial here. Those of you who cringe at the idea of blue cheese can substitute feta, or simply omit it. Vegans can leave out the cheese and substitute agave nectar and Vegannaise for honey and mayo in the dressing. There is plenty of flavor here without the cheese. If you’re vegetarian, be sure to use a cheese with a vegetarian rennet. Enjoy! 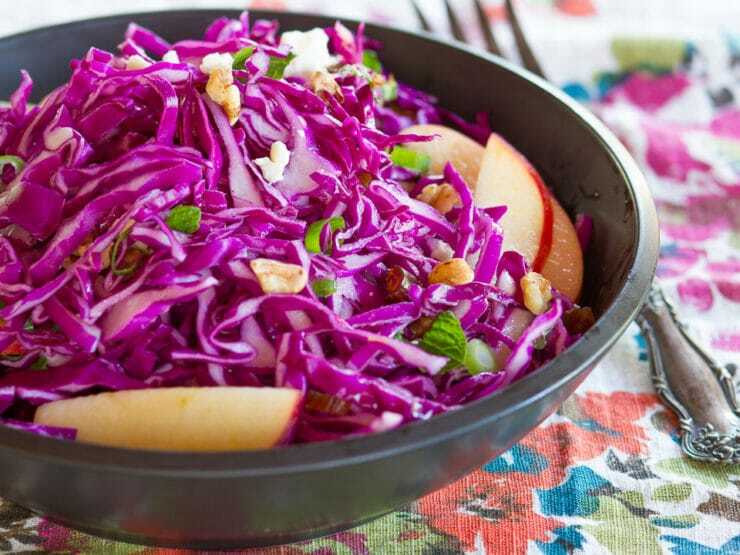 Unique and delicious cabbage salad recipe with apples, blue cheese, toasted walnuts, dates, green onions, mint and a tantalizing creamy dressing. Don't like blue cheese? Substitute feta or leave it out. Vegan Modification: Leave out the cheese and substitute agave nectar and Vegannaise for honey and mayo in the dressing. In a mixing bowl whisk together the olive oil, mayonnaise, red wine vinegar, dijon mustard, honey and salt until well combined. Toss the salad ingredients together with the dressing until the salad is evenly covered and ingredients are well mixed. Add the dressing to taste-- you may not need all of it depending on personal preference. Season with additional salt and freshly ground black pepper to taste, if desired. Serve. I made this salad over the weekend for a dinner party and it was a big hit. Even my picky husband liked it enough to have the leftovers the next day. I wasn’t sure what to expect when I put it together but it was a delicious surprise that I will definitely make again. I forgot to mention that I ran out of dates and had to substitute with dry prunes. I left the blue cheese on the side for those that wanted it. It still came out great. A tasty salad.my Israeli friends loved it. Sounds fantastic … two questions – you say to chop up the apples in tiny pieces, but the photos show much large pieces along the sides of the bowl? Are they for garnish along with the chopped pieces? Also do you use the entire scallion … green and white? Hi Nina, you can chop or slice the apples. Slices make for a prettier photo, chopped gives you more apple flavor with every bite. Totally your choice. 🙂 I only use the green part of the scallion. For your husband, try feta or goat cheese here, they will both work well too. Enjoy! So glad you liked it John! I served this at a dinner party last night, and it was absolutely incredible! Such an eclectic mix of flavors that really work, and the dressing is outstanding as well. I received several compliments. Thanks for sharing this, Tori! Going to make this for dinner! That doesn’t sound strange at all! It sounds awesome. Oddly one of my new-ish flavor combos is sauerkraut and apple, top that with some cheddar… Mmmmm.. Try it with orange slices added, too. Sounds delicious. I would love it. I think it sounds fantastic and healthy!! it sounds strange Tori Avey but I trust you. I LOVE red cabbage salad! Just a little olive oil and lemon and salt! Simple but addictive! 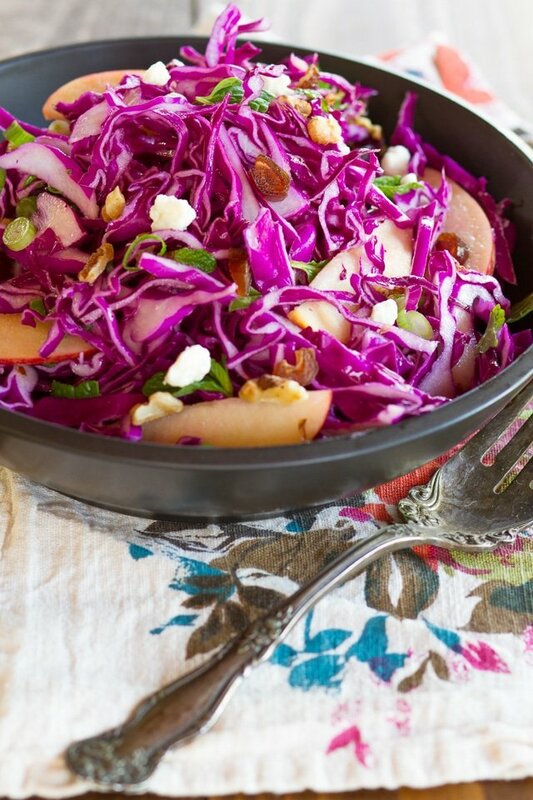 We make red cabbage and apples with a cider vinaigrette to go with pork. Very tasty! Yummy and very healthy too!